There are 1911’s then there are outstanding 1911’s and this Para is an outstanding one to say the least. Most 1911’s I have purchased have a feature or two I would like to add or a change to be made. This Para needs no changes or additions at all. The trigger is certified from the factory at 4 pounds.Mine measured 3pounds 14 ounces–perfect! It has an arched mainspring housing which is unusual from the factory these days but something I now have actually found preferable to the flat version. This Para comes with two magazines which I’m unsure as to who makes them but they look a lot like Wilson mags although they aren’t. They are 8 rounders. The barrel is a match type which Para claims is the most accurate barrel in the world. It also has a full ramped barrel. I’ve not owned a full size 1911 with a full ramped barrel before. This is a first for me but I’m sold. It’s works flawlessly. It’s very smoothly finished and shines like a new coin. The barrel is also crowned and forged. Something normally seen only on a custom 1911. The sights are very nice and easily aligned. This model comes with a rear sight with deep lateral serrations to cut down glare. 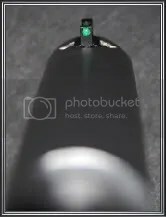 They have two white dots with the front sight having a fiber optic insert. The factory installs the front sight with a green insert and supplies a yellow and red one should you prefer one of the other colors. A polymer takedown tool is also provided in the box. They really stand out and for those of us who have passed 50 years old they are very nice indeed! Another feature I like is the lack of front slide serrations. I’ve always hated the addition of this feature ever since everyone started using them. They just don’t look right on a 1911 and for my use don’t serve any useful purpose. The fit and finish is perfect. The slide to frame fit is very snug (Para claims .0004 tolerances and that’s snug) which in this case is a good thing. Why? Because after 200 rounds there were no malfunctions of any type with any ammo I used in it. This means in spite of the very close tolerances this pistol is very reliable. I used ball as well as 4 types and brands of hollowpoints. I have trouble with many 1911’s when I try to keep my thumb on the safety when depressed and still manage to depress the grip safety enough to fire the pistol. There was no problem with this pistol. It was very easy to keep my thumb in position on the safety and still pull the trigger. The gunsmith I spoke with at Para tells me they had this in mind when the grip safety was designed and had the radius made a bit wider. The factory recoil spring is an 18.5 pound one where most factory springs are in the 16.5 to 17 pound range. This saved me some money in not having to order the 18.5 I normally use. The barrel bushing is also very snug put does not require a bushing wrench. If you look at the picture above you can see how snug the slide to frame fit is. The thumb safety is the tactical type left side only. I did change the grips to the Mil-Tac G10 grips with the 1* logo. This model Para also uses the GI recoil spring and plug rather than the full length guide rod which is a good thing in my opinion. I’ve never been that fond of the full length guide rod and have never seen any increase in accuracy from using one. 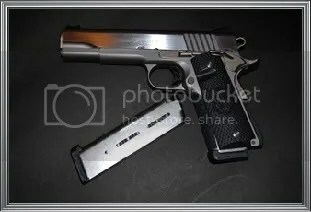 I also like the Power Extractor and I do believe it contributes to the reliability of the pistol. Para says that this extractor will rip the rim off a case rather than break the extractor or let the case rim slip under it. Accuracy with this pistol is outstanding! Of course most quality 1911’s these days show good accuracy. 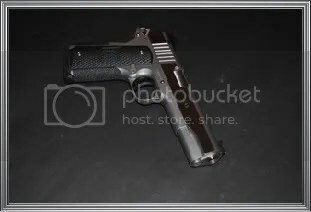 You can tell Para did their homework on this pistol. The accuracy is above average for any factory 1911. The picture above is a small Birchwood Casey target placed on a bad guy target. I did need to adjust the sights a small amount to move the point of aim a hair to the right. This target show the hits before I adjusted the rear sight. 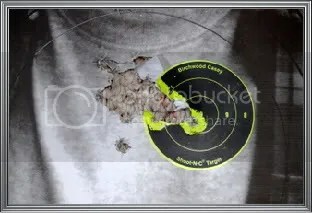 The target shows the hits I made from 10 yards at fairly rapid fire for a total of six magazines. Pretty darn good accuracy for 42 rounds at 10 yards!!! I did throw one round low as you can see by the target. I just can’t say enough about the fiber optic front sight!!! It just makes the front sight just jump out at you making it effortless to focus on the front sight. I didn’t take a picture of the second target but the number of rounds was the same with the group being 1/3 smaller than this group after adjusting the rear sight and getting used to this gun. The above group is the first group I fired from this pistol. Moyock, NC — In an unbelievable display of speed shooting and reliability, Todd Jarrett set a world record shooting 1,000 rounds of .45ACP through a Para USA PXT™ 1911 SSP model pistol. The record was set during a torture test conducted on the secure ranges at Blackwater USA’s Moyock, North Carolina, facility. Jarrett, who holds several world and national pistol titles, used the stock, out-of-the-box Para USA pistol to shoot 1,000 rounds in just 10 minutes and 44 seconds — a rate equivalent to one shot every 0.644 seconds. 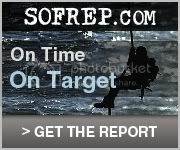 The entire torture test was documented by DownRange TV and video of the shoot is available for viewing online. Despite being supported by a team of loaders and a pile of 10-round Chip McCormick and 8-round Para PXT magazines for the single-stack 1911, Jarrett outpaced the loaders and found himself waiting for loaded mags. “Once I got into a shooting rhythm I quickly shot through the pre-loaded magazines and the loaders had problems keeping up. 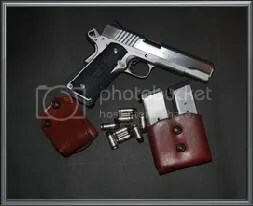 Add to that the natural difficulty of reloading a single-stack 1911, the reloads I bobbled and the mix of 10-round and 8-round magazines and I could have easily broken 10 minutes,” said Todd Jarrett. However it was heat that was the biggest obstacle and the true test of both shooter and gun. Shooting 93 rounds a minute, Jarrett estimates the pistol’s match-grade ramped barrel reached temperatures in excess of 550 degrees. “Even though the outside temperature was under 50 degrees, the gun’s temperature quickly rose to a point where it became hard to hold. I ended up with first-degree burns on the pad of my trigger finger which forced me to shoot even faster towards the end of the test,” explained Jarrett. The reliability story of the PXT doesn’t end there either. Jarrett and other shooters put a combined 5,000 rounds through the pistol in a 24-hour period without any failures. Jarrett attributed this solid performance under stress to Para USA’s focus on constant improvement and the development of the Power Extractor™. “We put 1,000 rounds through the pistol on Friday and cleaned the gun in preparation for the torture test. Then after completing the 1,000 round high-speed torture test we shot an additional 3,000 rounds. This is where having the more durable design of the Power Extractor really shines,” said Jarrett. The Para Power Extractor was specifically designed by Para’s engineers to address the one weakness in the original 1911 design. The PXT technology of the massive Power Extractor delivers improved feeding and positive extraction round after round – even through 5,000 in a day. “A test like this will expose any weakness in a gun’s design and there’s no doubt in my mind that the Power Extractor was a key part of the pistol’s reliability. Should someone break my time, I’ll be ready with another PXT to reclaim the record,” declared Jarrett.